The best of its kind in the market when it comes to performance, quality and price! 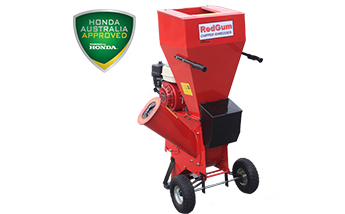 This RedGum GX200 Chipper instantly chips tree branches into valuable garden mulch AND shreds weeds, leaves, and garden refuse into nutrient-rich mulch and compost for gardens and flower beds. The Large hopper means a lot of time is saved because less preparation time is required trimming branches and brush into a size to fit the machine. This chipper also comes with handles and wheels so you can easily move the chipper from one location to another…and includes a handy storage compartment for tools, safety glasses, gloves and other accessories that assist in the effective usage of the RedGum Chipper….in fact we will include FREE a set of gloves, a pair of safety glasses and a chipper cover. Please click BUY NOW to purchase online! Please call us on 03 9794 8339 for a personalised freight quote if you would like delivery or free pickup at any RedShed Superstore. *This product is offered at a SPECIAL WEBSITE PRICE, which may be lower than the price advertised in store. From time to time the website advertised price will differ from the in store price. This practise allows us to monitor our online marketing campaigns. To take advantage of this great low price please remember to mention the online advertised price when in store at the time of purchase. Like to view or take a test drive of our extensive range in person? Then visit us at one of our 6 Superstore locations where a team member can run you through everything and help you find the perfect product to suit your needs. All of our products can now be purchased through our website. You will currently see a BUY NOW option on most of our products. When you click this button you will continue to the purchase page where you can quickly and effortlessly complete your order with us (it is a very quick process). All online purchases offer free store pick up from any of our 6 RedShed Superstores. Selected products also offer a flat rate shipping fee. When available, this option is clearly marked on the product pages. Alternatively, please call us on 03 9794 8339 if you would like a personalised delivery/ freight quote. Important Information for Deliveries - If no one is home at time of delivery then your order will be left at the front door. If you would like your order to be left elsewhere please add a note using the purchase page 'order notes' section. The RedShed uses Delivery Agents to deliver your goods. You agree that your details, including your Delivery Address, phone number and email address, will be supplied to the Delivery Agent for the purpose of delivering your Goods. If a product you wish to purchase online does not yet have the BUY NOW option please either call us on 03 9794 8339 or email: marketing@theredshed.com.au and we will activate this product for you. * Please click to read our privacy and delivery policies. Know what you’re after and want a quick sales process? Then you can email us your order and we will contact you straight away! Or, as you are looking through each of our products in detail you will also notice there is a quick enquiry form you can fill out. Call 1300 136 572 to get advice and be transferred to your closest store.